Really low, we properly pass a null value instead of an undefined one, without breaking JS. 1. After normal boot, suspend or lock. - Switch with keyboard (Super+space) or mouse. BUT if you then logout on the login screen *when you press the first character* of the password the shown selected keyboard layout resets. Gnome shell version 3.28.3 Ubuntu 18.04.1. JS WARNING: [resource:///org/gnome/shell/ui/keyboard.js 546]: reference to undefined property "_rect"
Moreover problem appear not only in 18.04 but also in 18.10 version. Rolling back gnome-shell and gnome-shell-common packages fix this problem, so i added gnome-shell to affected packages. - What desktop session do you use? 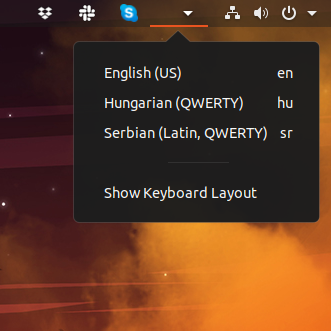 - What keyboard layouts do you have configued in GNOME? - Could you add your journalctl log after getting the issue? @PabloAB or @Sebastian Becher could you please tell how long one has to wait before the new update to gnome-shell fixes the issue? I wanted to avoid the method from Petruhin Alexandr of rolling back to earlier version of gnome-shell. I can wait for the new update if it doesn't take much time as you have mentioned above in the link above somebody already fixed the issue. I don't think that the fix mentioned in such issue is the fix for it though. I can confirm the issue on Ubuntu 18.10 (Cosmic) as well. I experienced that beside locking the screen, seeing the elevated prompt dialog (when the screen is dimmed) also makes the keyboard layout indicator disappear. Will be gnome-shell - version 3.30.2-2ubuntu1 available for cosmic too? will this fix be backported to Ubuntu 18.04 bionic release gnome-shell package? None of them are causing the issue anymore. Yes, I think it should be backported. I also noticed that keyboard layout indicator is cleared not only after suspension but more often. - I can't verify Cosmic because (as said on Description and title) I'm using Bionic. - About links (Testing/EnableProposed QATeam/PerformingSRUVerification): tl;dr, but either way, as said, I'm using bionic. Should be a *easy and safety way* to test a certain proposed package. PS, taking advantage of the visibility of this bug: I hope some day this awful obsolete site uses something like Gitlab! Hello, when can we expect to get an update on 18.04? 18.04 is LTS, and all our workstations are 18.04. Next update will be 20.04. IMHO, 18.04 should be the reference... and bugs should be fixed there first, then adapted to 18.10.
i'm checked 3.30.2-0ubuntu1.18.10.1 gnome-shell and can confirm that problem is fixed. The bug is in queue for Bionic too , since being an LTS there are also more checks before releasing any change. Where will be fixed in Ubuntu 18.04 LTS? It has been a long long time for Bionic. Ubuntu 18.04.2 LTS, more than five weeks are now gone with this very annoying bug (that resulted from "fixing" a different bug without rigorous testing). Status: in progress. Nobody seems to bother: either Canonical, or the maintainers. Unbelievable. So we actually care of fixes, like we care about no regress in other things and so being a little conservative before releasing a new version. Marco, thanks for your hard work, and for taking care of this. Marco, installed your ppa and found an error. For all the time of use, the layout did not disappear. I'm sorry, what you mean by "layout"? I installed packages from ppa:ci-train-ppa-service/3597, the problem disappeared, thanks. There is a new problem, attached a screenshot, on the right side of the window. Can you please tell how long one has to wait for approval (in case of bionic)? (a certain deadline will help no matter how far it is). This bug is very irritating. It appears the screenshot in comment #31 does not contain this bug. So if there's a problem there then please log a new bug. A temporary solution is to rollback gnome-shell gnome-shell-common to the previous versions, as described here https://askubuntu.com/a/1110089/190625. I see no major issues with these versions. I am also disappointed with the patch not being merged in bionic. It's definitely not the 'Ubuntu way' to tackle such issues in an LTS distribution. Please be tolerant with those with a rude attitude. Enabled proposed and updated my system and the bug is fixed for me as well. I don't really get it, when's the fix going to be available for Bionic? I have -updates enabled, but the bug is still present on my system. but the bug is still here. Reboot don't help. (per comment #37) but is not released yet. Any info on when's that going to be released? Can't find it. I was confused by message from sil2100 where he claims: "The verification of the Stable Release Update for gnome-shell has completed successfully and the package has now been released to -updates." Obviously, right now - it is not in updates, still only in proposed. OK that message in comment #43 was bound to cause confusion. It was actually about the fix for 18.10 (cosmic). I installed the fix on Bionic by enabling proposed updates in settings and running Software Updater then. Everything looks fine and the problem is solved. But before when I tried to install via terminal gnome-shell/bionic-proposed and gnome-shell-common/bionic-proposed, it broke Gnome. Полёт нормальный языковая панель не исчезает . СПАСИБО !!!! I still don't get it. It's been unfixed in Bionic since forever. Do I need to enable -proposed do get the fix? I thought this was risky. It's really annoying. Also confirming that after setting up checkbox in Software Updates -> Developer Options -> Pre released updates (bionic-proposed) and upgrading packages, the problem fixed. I can also confirm that after following the instructions from #51 on Bionic, this bug is fixed.